Tour 1: Panoramic Route and Wine Tasting. Tour 2: Cape of Good Hope, Cape Point and Penguins. Tour 3: Cape Town Mother City and Table Mountain. Tour 4: Cape Town City OR Kirstenbosch AND Robben Island. Tour 5: Cape Winelands: Stellenbosch & Franschhoek with a “dash” of Pinotage. Tour 6: Cape Winelands: Stellenbosch, Franschhoek and Paarl with a “dash” of Pinotage. Tour 7: Land Based Whale Watching and Penguins with optional boat trip (July to November). Tour 8: Diamond and Tanzanite Workshop and Craft Market. Tour 9: Tip of Africa – Cape Agulhas, the Southernmost point of the African Continent. Tour 10: Great White Shark Diving. Tour 11: “Big Five” Acquila Safari. Cape Town Based Full Day tour to the tip of Africa – Cape Agulhas, the Southernmost point of the African Continent. Another mountain pass leads you into the area where you will see from afar the barley-, wheat-, canola fields and the Grass Lands where we farm with sheep. This is also the area where we spot our national bird, the Blue Crane. 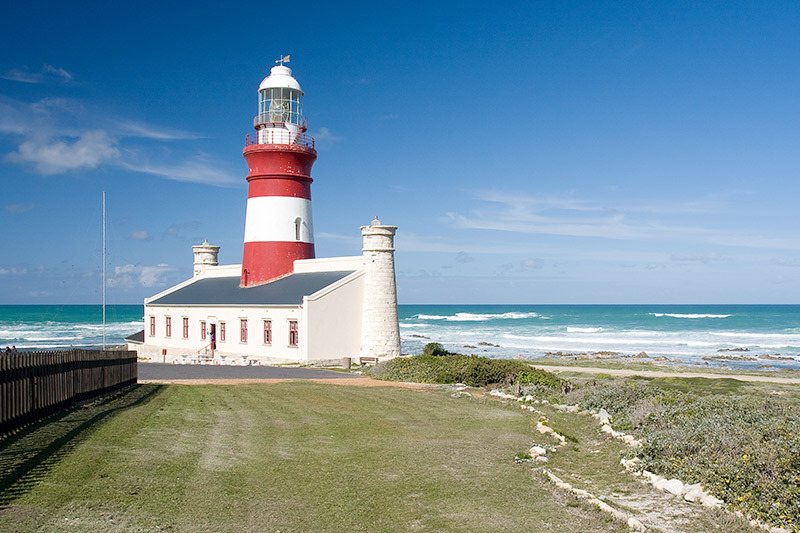 On arrival at Cape Agulhas – the “Southern Tip” experience follows and we visit the light house and stop for lunch. 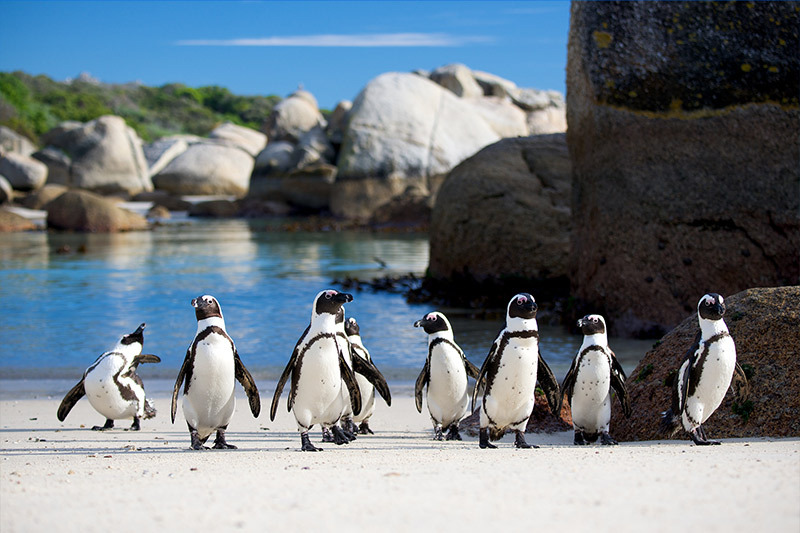 The drive back will take us to the Penguin Colony and via the spectacular Clarence Drive we approach the Mother City. Drop off at approximately 17h00. Pick up at 08h00 and we leave the Mother City. We head for Sir Lowry’s Pass from where you will have a stunning view of the towns of Gordon’s Bay, Strand, Somerset West and even Cape Town and Table Mountain in the distance. Stop on the mountain to capture the fantastic scenery down below. After doing the beautiful Houwhoek Pass, we descend into an area from where we will have the never-ending wheat fields in view. Seasonal time the yellow Canola fields makes an awesome picture. 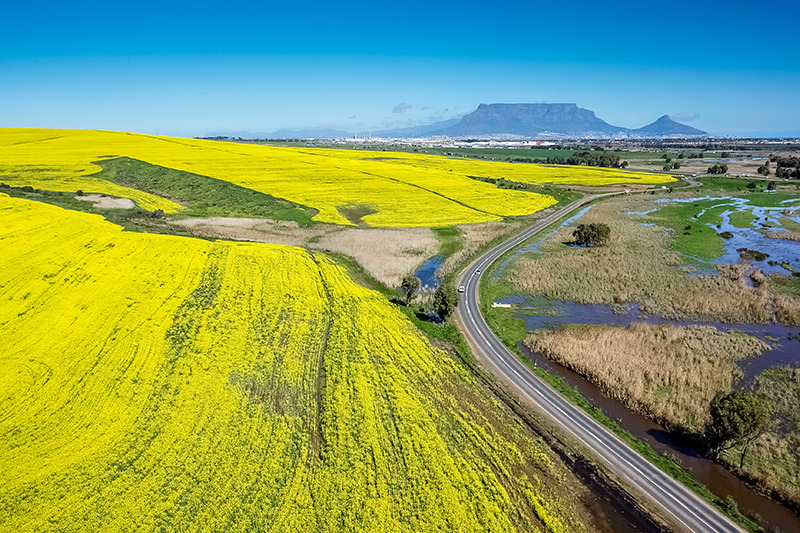 The town of Caledon follows, one of the main centres in the Western Cape for the production of wheat. On the way to Bredasdorp we keep our eyes peeled for a sight of our National bird, the Blue Crane. Should you wish we can stop in Napier for a welcome cup of coffee. 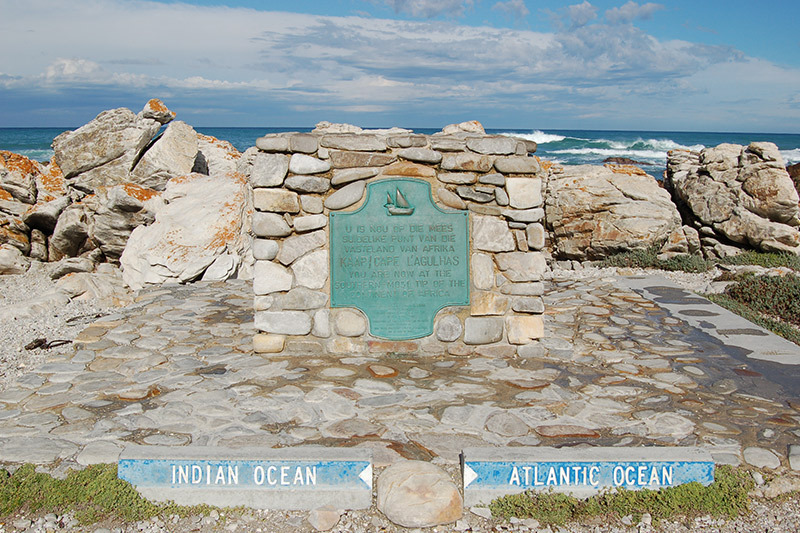 On arrival at Cape Agulhas we drive to the exact spot where the Indian- and the Atlantic Oceans meet. Right in front of the signboard you can put your one foot on the Indian Ocean side and the other on the Atlantis Ocean side – we will take the pictures. Lighthouse visit follows where after we enjoy lunch. 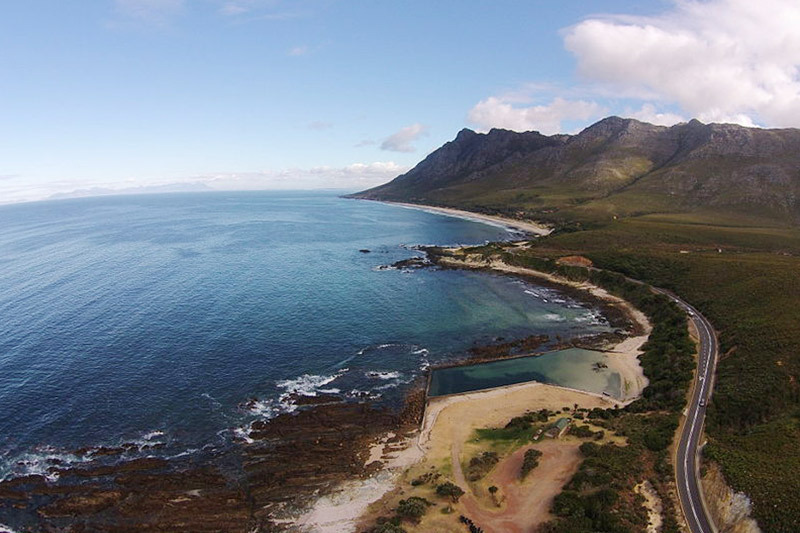 After lunch we return via the coastal towns of Kleinmond, Pringle Bay, Betty’s Bay, Rooiels and Gordon’s Bay. However, we stop on the way at Danger point to view the hundreds of African Penguins. Should we have time we stop at the Harold Porter Botanical garden for a 30-minute hike and coffee. The awesome Clarence drive is next as we meander our way all along the coast of False Bay to Gordon’s Bay. Drop off in Cape Town around 17h00. per person for first 2 pax thereafter R1200.00 additional per person. Children – See Terms & Conditions. Included: Guiding by accredited tourist driver-guide in luxury sedan or minibus, mineral water, entrance fees – Stoney Point Penguins. Passengers: Minimum 2, Maximum 7.